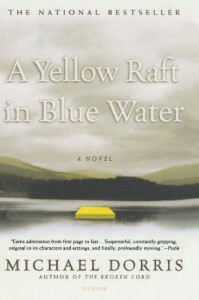 If I were ever asked what my favorite book is, my answer would be "A Yellow Raft In Blue Water." I read this book as a child in high school and I can still remember the impact this book had on me many years later. A beautiful book about the relationships people can have with family and with complete strangers, and how the relationships with both groups can have lasting effects, both positive and negative, on us as we progress with life. It's also a book about how a person's life can be affected in ways unknown to the person by the actions of family members who came before. Beautifully written with three wonderful leading characters, I highly recommend this book to those looking for a book that touches you deeply.